Disclaimer: This post is sponsored by Gymboree, but the words and opinions are my own. See something you like while you're reading through? Just click on the image and you will be taken directly to that item in Gymboree's store using my affiliate link! Grab your little one and curl up with a good book! 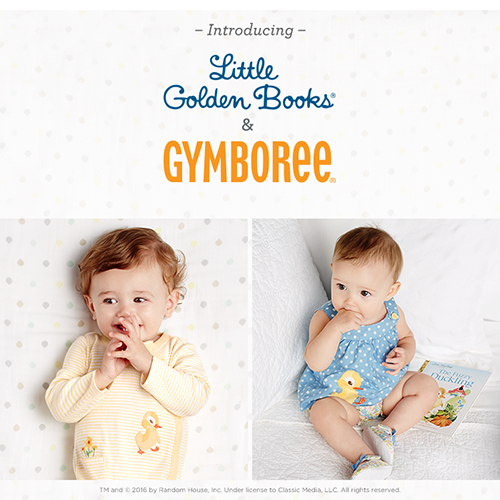 That's what you'll want to do when you see Gymboree's new Little Golden Books Baby Collection! Based on the classic children’s books we know and love, Gymboree has a whole line of baby clothes featuring “The Poky Little Puppy”, “The Fuzzy Little Duckling” and “The Shy Little Kitten”. Anyone who has tried to feed their child applesauce understands that dinner is probably going to go one of two ways: 1) your dining room looks like an apple exploded, or 2) you end up spoon feeding your child their entire meal while yours gets cold and soggy. But there is also a third option: you can put that applesauce into a BasicsBest reusable food pouch and your child can feed herself without the mess! The first time I saw someone using a food pouch I thought it was silly, but I got caught out on a shopping trip and needed something to feed my kid fast. I grabbed a pouch of pureed spinach and pears off the shelf. My daughter loved it! She goes crazy for food pouches like most kids do for candy. And you know what? She's getting excited about fruit, vegetables, and yogurt! This post is sponsored by Gymboree, however all opinions are my own. I love finding cute new clothes for my daughter, but no matter how big she may get, there's something special about newborn outfits. Gymboree's Newborn Essentials collection is no exception. Although the alphabet themed outfits are cute, my favorite has to be the bears! Let's start with the gray-and-white striped body suit. The long sleeves are great for winter, and the little pocket is a nice touch. Look familiar? Some mornings when I go to take a shower I find my bathtub has been invaded by rubber ducks! So I decided to try the Babyola Bath Time Toy Organizer (affiliate link) to corral all of my daughter's bath toys. These are the diapers that my husband and I prefer! These diapers are reasonably priced and very absorbent. As a bonus, they have a nice baby powder scent which makes our nursery smell good. Occasionally our grocery store will run a sell on Luvs which makes them the same prices as Comforts For Baby. In that case, we stock up! Plus, I'd like to give a shout-out to whoever runs Luvs' Twitter account. You make my day! This was the big surprise for us. These diapers are the best deal for your money. Some off-brand diapers feel paper-thin, but these are absorbent, without being "poofy". I give these a lot for baby showers just to show moms that they have low-priced options that work! Note: These diapers run a size smaller than most. So if your child wears a size 1 in other brands, you're going to want a size 2. Don't let the way these diapers look fool you. They are very absorbent, they just don't look or feel like it. My husband and I like these diapers (especially the price), but the fact that the diaper turns yellow when it's wet grosses other people out. Target tends to run some pretty good sales on these diapers, but we don't really have a Target close to us. My husband and I thought about ordering them online in bulk and taking advantage of their free shipping, but it's a lot more convenient for us to pick up diapers when we're grocery shopping. Note: When Target runs a really good promotion on their diapers, expect them to sell out quickly! I wish I would have known a few years ago that there was such a thing as "meat claws". I recently got a set of and I really could have used them sooner! My parents catered my wedding (BBQ pork, beef, & goat), and things didn't exactly go as planned. My dad and brother smoked the meat while my mom and soon-to-be sister-in-law shredded it as it was brought in the house. Of course, the meat was hot, so they had to wait for it to cool. Around 2 a.m.(?) they finally finished shredding all the meat. Had they been provided a pair of meat claws, I think things would have gone a little faster. Disclaimer: I received this product at a heavily discounted price in exchange for my honest opinion. Anyone who knows me knows I love coffee. Ever since I was little, I wanted to drink coffee like my dad and my grandpa. Walking down the coffee aisle at the grocery store just makes me happy. So why I am just now getting my first coffee grinder, I don't really know. The mosquitos have not been nice to me this summer. I am like a mosquito magnet. Part of this, I'm sure, is that I filled up my daughter's kiddie pool for her and then forgot to dump it, which created a mosquito fantasy land! I thought I would try out this Wing Wing Mosquito Bracelet to deter the mosquitoes. The bracelet itself is actually kind of cute. It is a white band with a pink citronella insert. I'm not sure the bands would fit well for most men, but I have small wrists so it fit me fine. I looked at the package to see if there were any special instructions, but all of the labeling was in Korean. The only part I understood were three cute pictures of families outside, having fun. So that's what I decided to do--go outside and have some fun. My husband and I met up with my dad for an afternoon of canoeing and kayaking. We spent several hours on the river seeing how far we could paddle before the water got too shallow. After bringing to boats up on shore I made a trip up to the bathhouse and discovered I had been bit four different places on my legs. I wondered if maybe I was too tall for the range of the citronella. I'm not freakishly tall, but, at 5'10" I'm not exactly short either. My daughter right now is working on teeth #5 and #6. Her first four teeth didn't give her any problems, but with these last two she will bite down on a piece of cereal or a cracker and then start screaming and pulling the pieces of food out of her mouth as quickly as she can. For this reason, I was excited to have the chance to review the Baltic Amber Teething Necklace. Several of my trusted mom-friends have had great results with amber necklaces, with the most common response being, "I wish I had had one of these for all my kids!" I learned after receiving the necklace that my daycare does not allow them. So because my daughter can only wear the necklace while she's with me I didn't see the same results that my friends did. There was a small bit of relief, as her scream turned more into a whine, but my friends defiantly had much better results. I contacted the person I received the necklace from and learned that the amount of time the necklace is worn does has an effect on the efficacy. Disclaimer: I received this cleaner for free in order to write a review. Below is my honest opinion of the product after using it in my own home. If you are interested in purchasing this, or other products from Greenwald's, I have provided affiliate links at the end of this post. When you purchase an item using one of my affiliate links I receive a commission for the sale, which helps support this blog. I will admit, I am a little skeptical of environmentally friendly cleaners. It's not that I'm out to destroy the environment or anything. I'm just a little worried that I'll spend extra money and end up with a bottle of colored water. So I was pleasantly surprised to find that Greenwald's cleaners cost less than my regular cleaners, but create less waste. Our town doesn't recycle old spray bottles, so they always end up in the trash. Greenwald's cleaners come in dissolving packets that you can use in your own spray bottles. Even though the idea of saving money and keeping plastic bottles out the landfill appealed to me, I still was a little skeptical. So I decided to put it up against the toughest cleaning job I know--my bathtub!